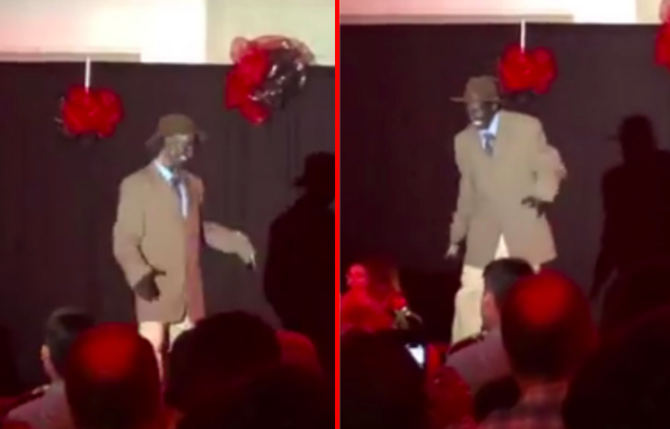 Video of a drag king performing in blackface at a youth fundraiser in Hawaii has hit the internet and it’s truly cringeworthy. The racist performance happened at Kauai Beach Resort last Friday during “A Show Fit for a Queen,” a charity event hosted by several local drag performers to raise money for a local youth suicide prevention group. The lineup included several popular local queens, as well as the “Special Guest Male Impersonator” by the name of Muddy, The King of Memphis. But when Muddy hit the stage, the crowd was horrified. The 20-second clip, which was posted to Facebook by Gary Clayton Brown, who was in attendance at the show, shows the performer dancing to “Bad To The Bone” by George Thorogood. Brown adds that Muddy had two other numbers listed in the program but never appeared on stage again after his first performance. The identity of the person who played Muddy remains unknown. lol, some people are too much. Everyone knows you should only troll behind a keyboard. The title is, again, very misleading; The audience isn’t watching “in horror,” they’re all watching with general indifference, which is just as bad. If someone tried to do this in my city, he’d/she’d end up getting things thrown at them, booed, and get blacklisted from performing anywhere in the city. I love to see and hear examples of political correctness being spoofed! Good for him! “If someone tried to do this in my city”. Wait, you have an entire city? Good for you. Could there be a possibility of ANY blackface done which is OK? Could there be any comedic act, wrapped up with hilarious, acerbic and sarcastic commentary about overly-correct political correctness? I’m not seeing it, but maybe an uber sophisticated comedian could pull it off. I would not see around it, and would be uncomfortable with any blackface. Black comedans do white face all the time. Dave Chapelles KKK skit was funny as hell. Tropic Thunder? Didn’t see it so don’t have anything to say about it. Responding to ChrisK below, blackface was created to demean and exclude. There is no equivalent “whiteface.” Examples of actual parallels would be Mickey Rooney in “Breakfast at Tiffany”, Harry Shearer in The Simpsons, and Johnny Depp in The Lone Ranger. STRANGE, WHEN A STRAIGHT GUY PLAYS A GAY, THEY SAY IT IS CALLED ACTING, BUT WHEN A WHITE PERSON PLAYS A BLACK PERSON IT IS RACISM. WHAT’S THE DIFFERENCE. James, if you can’t tell the difference between acting and dehumanizing caricatures, I suggest you spend some time with people who do. PS Little known secret, so keep it under wraps: gay people play straights too. PPS Another little known secret – scientific studies show a high positive correlation between caps lock use and and being profoundly wrong.